Caribou herds are shrinking across the North, and that’s especially worrying for Indigenous communities where they’re a historically important source of food. One caribou population, called the Bathurst herd, which ranges across the southern Northwest Territories, western Nunavut and northern Saskatchewan, has dropped 96 per cent in 30 years — from 450,000 animals down to about 20,000. Determined to see the herd recover, Indigenous communities in the area have stopped hunting the animals, and have been working with governments and scientists on a plan to protect their habitat. Caribou populations drop periodically because of a complex interplay of weather, food supply, predators, parasites and other factors. Climate change is intensifying these, and for the Bathurst herd, industrial development — mineral exploration, mines and winter roads — has brought added stress. Determined to see the herd recover, Indigenous communities in the area have stopped hunting the animals, and have been working with governments and scientists on a plan to protect their habitat. Through their land claims agreements, northern Indigenous governments and organizations work with territorial governments to both manage wildlife and review proposed industrial projects, balancing environmental protection with potential economic benefits to communities. 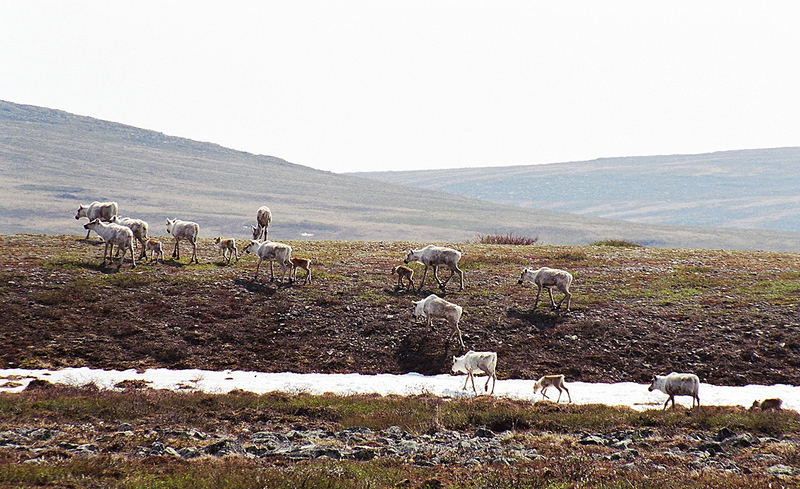 In 2014, groups within the Bathurst caribou range requested that the Government of the Northwest Territories (GNWT) develop a plan to protect the herd from the effects of industrial development. Every fall, the Bathurst caribou pick their way around or across lakes and rivers as they migrate south from the barren lands to the boreal forest, where they spend the winter. In some locations, thousands of animals funnel into narrow strips of land between water bodies or swim across narrows. These crossings, the Elders say, are crucial and need special protection. After four years of consultation and research, the range plan is nearly ready. One of the more unusual of its nine recommendations involves protection that moves with the caribou. Clark explains: “You draw a polygon around a group of caribou on the landscape. As they move, that polygon moves with them, and any industrial project within it has restrictions on its activities.” The plan also recommends protecting winter habitats as much as possible from wildfires, which are intensifying because of climate change.